Businesses across multiple industries have embraced digital transformation (DX) technologies. In fact, an estimated 89 percent of organizations worldwide have embarked on digitization, according to the International Data Corporation, by reassessing their current assets and leveraging them in new ways. But while these innovators swap manual processes for digital alternatives, companies in the food and beverage space preserve their existing processes, despite growing customer demand for more innovative services. Modern consumers want convenient food purchasing experiences. Approximately 9 percent of American consumers, or 10.5 million households, purchased a meal kit between September 2017 and March 2018, and about 30 million more said they were considering doing so in the following five to six months, Nielsen reported. In addition to ordering ready-to-cook meals, many U.S. families are taking advantage of online grocery delivery services. As a result, web-based grocery sales are growing 10 times faster than in-store sales, Brick Meets Click found. Major food and beverage firms such as Coca-Cola have long relied on brick-and-mortar partners. This sales channel is no longer viable by itself. Businesses in the space must meet consumers where they are, which is online. But how does an organization make this switch when their route to market has always run through grocers and other sellers? In the case of Coca-Cola, the answer is trial and error. The soda giant juggles multiple experimental initiatives aimed at engaging customers online, including partnerships with Amazon and Uber Eats, and direct-to-consumer order fulfillment for specialty products. In doing so, the brand hopes to pinpoint and cultivate a successful and sustainable web-based sales channel and carve out a clear path for moving past its traditional store-based business model. Consumers that shop for groceries online or cook with meal kits normally have good reasons for embracing these products and services. A single parent might get meals through HelloFresh to save time, while a young couple might choose to shop with Peapod out of the desire to buy local. 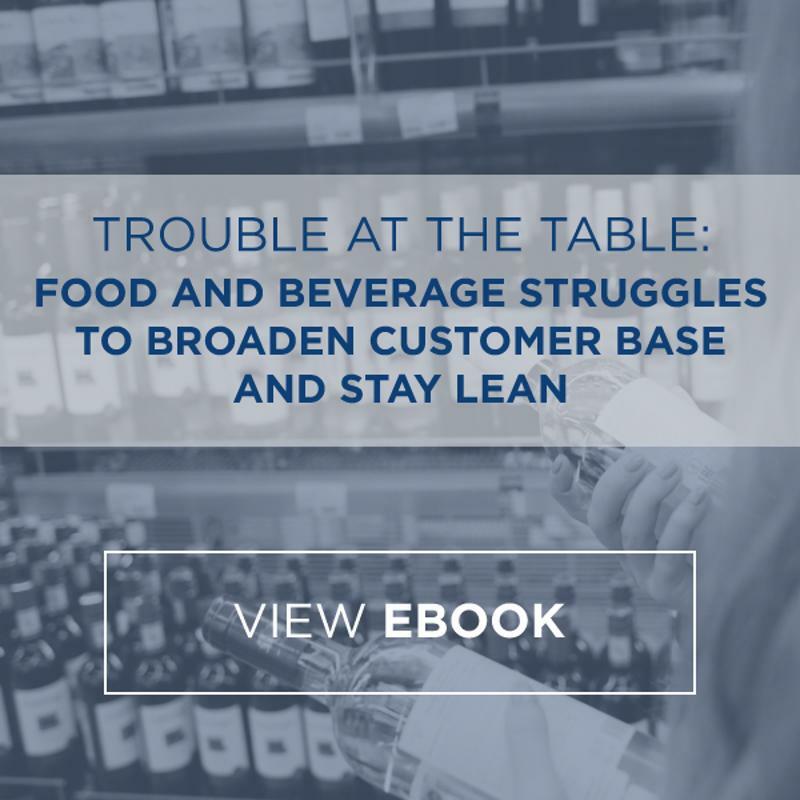 Food and beverage businesses have to tailor their sales and distribution models to meet the distinct needs of multiple demographics, something that is not so easy for larger brands that have been selling the same products the same way for decades. Campbell Soup Company grappled with this very issue in 2017, when it attempted to enter the digital marketplace, according to Bloomberg. To put it simply, its canned soups did not have a good reputation among the younger customers that populated the sales channels that Campbell pursued. So the company got creative and developed an artisanal soup delivery service that shuttled variations of its core products, made with fresh, local vegetables, to source-conscious consumers. The soups even arrived in glass mason jars. This move allowed the brand to meet the needs of new customers and move into the digital realm. Workable application-based delivery workflows or an e-commerce presence is not enough for latecomers in the food and beverage sector. If these businesses are serious about looking to attract customers of the digital age, they must also roll out promotional efforts that draw clicks, likes and shares. For businesses that have banked on their decades of brand capital, the prospect of recultivating this cachet on new channels can seem daunting or even impossible. General Mills recently faced this challenge when it began exploring new digital opportunities, Food Dive reported. Like Coca-Cola, the food and beverage conglomerate looked into multiple avenues and eventually found a way to form connections with online consumers through recipes and meal suggestions. The company hopes these relationships will serve it well as it traverses groundbreaking operational territory in an attempt to find success with digitization. Here at USC Consulting Group, we’ve been collaborating with organizations in the food and beverage space for decades, helping them transform their operations and adapt to marketplace shifts of all kinds. Connect with us today to learn more about our experience in the industry and how we can assist your organization as it moves forward.